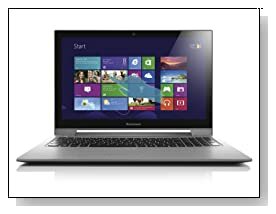 Eye-catching Lenovo IdeaPad S500 is a 10 point 15.6 inch touchscreen display, light and portable, sleek and low cost notebook. Supported by a robust i3 processor, lengthy battery-life, great display and audio and the comfy AccuType keyboard. Now with a reduced price on Amazon..
Intel Core i3 3227U (3 MB Cache) at 1.9 GHz speed, 4 GB DDR3 RAM, 500 GB hard drive at 5400 RPM.. It is more than adequate for everyday usage like browsing the internet, working with documents, watching videos, but not so much for extreme 3D video gaming. System starts up in about seven seconds even with plenty of programs installed on it. 15.6 inch multi-touch display at 1366 x 768 pixel resolution is optimized for Windows 8. You'll experience attractive and realistic pictures with the built-in Intel HD 4000 graphics. The touchscreen is very intuitive and functions well, while enabling getting acquainted to windows 8 a lot less difficult. Sound system through the integrated stereo speakers and Dolby Advanced Audio v2 brings great quality cinematic surround-sound feel. You can play your songs and movies louder without experiencing deformity. You can also personalize your sound configurations in order to lock-in your desired volume level for a better playing experience. 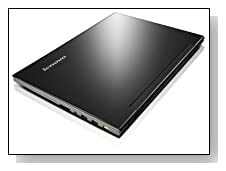 Black and stylish Lenovo Ideapad is 0.90 inch thick and weighs only 5.1 pounds. Its 48wh 4-cell battery gives you up to 7 hours in light use and roughly 6 hours in average use. Lenovo Energy Management reduces energy usage and helps safeguard the longevity of your battery while improving the time spent between charges. Lenovo S500 comes with a comfy and easy to use full AccuType keyboard with a 10 key number pad and smart multi-gesture touchpad for typing accuracy, effortless scrolling and zoom features. It doesn't have an optical drive, like many laptops nowadays but connection options such as 2 x USB 2.0 Ports, 1 x USB 3.0 Port, 2-in-1 card-reader, 802.11bgn wireless, HDMI out and an integrated 720p HD webcam for fun Skype chats with friends and family. OneKey Recovery System helps make data backup and recovery quick and easy. Conclusion: Features to cost ratio is quite high on Lenovo Ideapad S500. It offers sturdyness, durability, reasonable overall performance, decent battery life, responsive touchscreen, comfortable keyboard, good audio and video quality, modern attractive looks at an affordable price. And Amazon is probably the right place to buy it, with their fast delivery and lowest prices in the market.